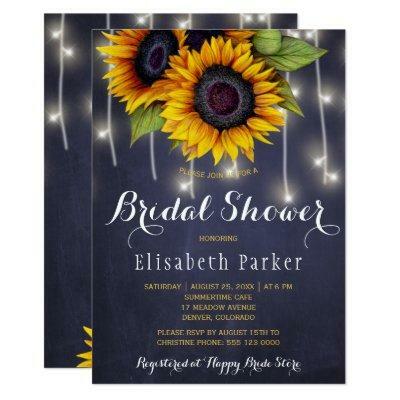 Rustic country style bridal shower party stylish invitation template on dark midnight navy blue chalkboard background featuring big yellow gold sunflowers bouquets and strings of white twinkle lights. +++++++++++Personalize with your details! You can choose to customize it further changing fonts and colors of lettering. +++++++++++ The invitation is suitable for summer or autumn fall outdoor garden / backyard rustic country bridal showers / brunch /luncheon parties.